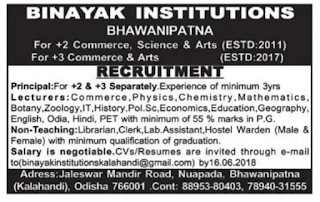 Binayak Institutions, Bhawanipatna ,has advertised in THE Sambad newspaper for recruitment of Principal, LECTURER, Non Teaching Faculty jobs vacancies. Interested and eligible job aspirants are requested to apply on or before 16.06.2018. Check out further more details below. 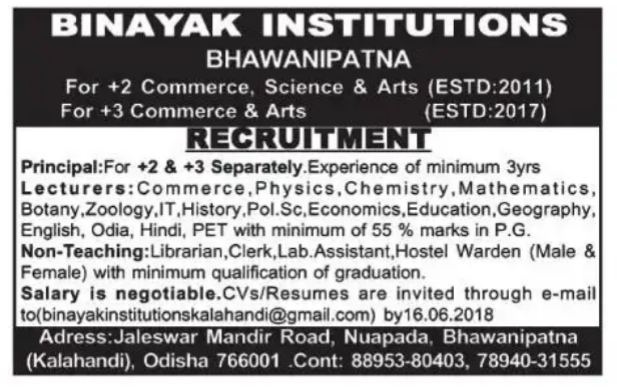 Name of the College: Binayak Institutions, Bhawanipatna. About College:Higher Secondary ( + 2) Education is the primary stepping stone towards journey for a bright career. In the present socioeconomic scenario the career of a student stands as a primary agenda to enter into the competitive and career world. A student faces both state and national level entrance examinations to reach his dream destination, be it Engineering. Medical, Management or IT, The students of Orissa are highly talented, tenacious and hard working. Inspite of their hard labour their performance in various competitions is not that satisfactory which worries every one of us. The deteriorated teaching standard in many colleges and lack of proper coaching, teaching and orientations are some of the factors which need serious consideration. Most of the +2 Colleges of our state are attached to Degree Colleges as a result the +2 Education does not get the attention that it requires.